Are you planning to buy a printer? Can’t decide between inkjet or laser? Below you will find a comparison between the two. Price: The price for inkjet printers are very low. However, that is a marketing scheme developed by the printer manufacturers. Inkjet cartridges have very low lifespan and require frequent refill or replacements. Sometimes the cost of cartridges is higher than the actual printer price. On the other hand, laser printers are more expensive but the toners are able to produce over 5000-8000 pages before replacement. Typically, an inkjet cartridge is able to produce 120 to 200 pages of printed documents. If you compare the two, you will be getting $0.15 to $0.28 per page for inkjet printers where as the laser will amount to only $0.01 to $0.05 per page depending on the price. Speed: Inkjet printers have improved much in terms of speed over the last years. However, laser printers are still by far the fastest. Often, inkjet printers don’t meet the speed claimed on their feature list. Quality: Laser printers provide better quality printing than inkjet printers. Documents printed with laser do not smudge ink if wet. However, if you are printing photos, inkjets will produce a better result. But that will increase your cost of cartridge replacement significantly as well. It may be a better idea to get the photos printed from a outside source. You will get a better savings that way. Inkjets are good at printing cd/dvd labels. Paper Selection: Laser printers offer more flexibility when it comes to choosing paper. Inkjets require specific papers based on printing needs. Noise: Inkjet printers are usually very noisy. Laser printers offer quiet operation. 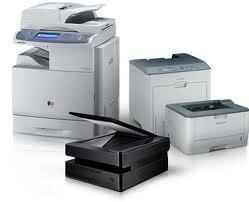 Size: One of the disadvantages with laser printers is that they are bulky and require more space for storage. Inkjet printers on the other hand are small and easy to store. Reliability: Depends on the cost of the printers. However, inkjets are known to give cartridge errors often. Laser printers are known to have more paper jams. On the long run, laser printers will outperform inkjets.